Chocolate Paleo Banana Bread that is gluten free and dairy free. I grew up eating a lot of Banana Bread. It was always a favorite treat of mine and my Grandma would bake it whenever there were lots of ripe banana’s, or for bake sales at the church. Her banana bread was always moist and had the perfect texture. I created a recipe extremely similar to her’s and it is in my cookbook. However, I wanted a Paleo Banana Bread recipe to keep in my back pocket for a healthy breakfast that I could eat on-the-go. Of course I decided a Chocolate Paleo Banana Bread would be absolutely perfect. My husband and kids are chocoholics. I have tried getting them to eat plain banana bread a million time and they will a little, but I am the one that ends up eating most of it. While I don’t feel the guilt with this recipe- I still don’t need to eat an entire loaf to myself. This Paleo Chocolate Banana Bread recipe was an absolute crowd pleaser. It is moist and has the most amazing texture. I love that it is healthy, but tastes decadent. I made a loaf to share with my fellow PTO mom’s and they were all very impressed that it was grain free, dairy free, and sugar free. Chocolate Paleo Banana Bread will be your go-to recipe to use up those ripe banana’s and to have a healthy breakfast or snack on hand. It’s perfect to share with friends if you are having a pot luck or teacher appreciation, but my family never had a problem finishing this up on our own. 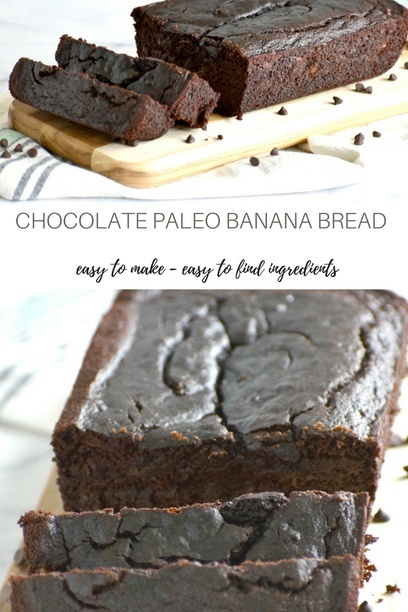 How do I make Chocolate Paleo Banana Bread? It is so incredibly simple and you will love it! You will start with my Grain Free All Purpose Flour recipe as the flour base for this. In a bowl you will blend the dry ingredients. This includes the coconut sugar. Preheat the oven to 350 degrees. One the dry ingredients are blended well you can add the mashed banana, vanilla, applesauce and eggs. Blend it well and you can do this all by hand, or with a mixer. Add the coconut oil last and stir until it is all blended in. Grease your loaf pan and pour the batter in and bake for 55 minutes, or until a toothpick comes out clean. Allow it to cool for atleast 20 minutes and then you can use a butter knife around the edges of the bread inside of the loaf pan to loosen it and then pop it out onto a cooling rack lined with parchment paper. You can leave these out on the counter for a few days, but if there is any left over after that I would recommend storing in the refrigerator. Pro-tip: I use a potato masher to mash my bananas. It makes it fast and easy. Pro-tip: I grease my loaf pan with coconut oil. It is the best greaser I have used. Why do I need Grain Free All Purpose Flour? Most paleo recipes just contain different measurements of 3-5 flours in the recipes. I created this Grain Free All Purpose Flour to make baking paleo easier and I make a batch and store it in my pantry. It works amazing. What is Grain Free Baking Powder? Most brands of baking powder contain corn starch. Corn is a grain, therefore is not paleo. Making your own grain free baking powder is as easy as blending baking powder and cream of tartar. If you are not paleo or grain free then feel free to use whatever baking powder you have on hand. So, if you would like to make your own Grain Free Baking Powder then HERE is the link to it. Why Paleo and what does that mean? Paleo means it is free from grains, dairy, legumes and refined sugar. This is sweetened with coconut sugar so you can feel good about it. 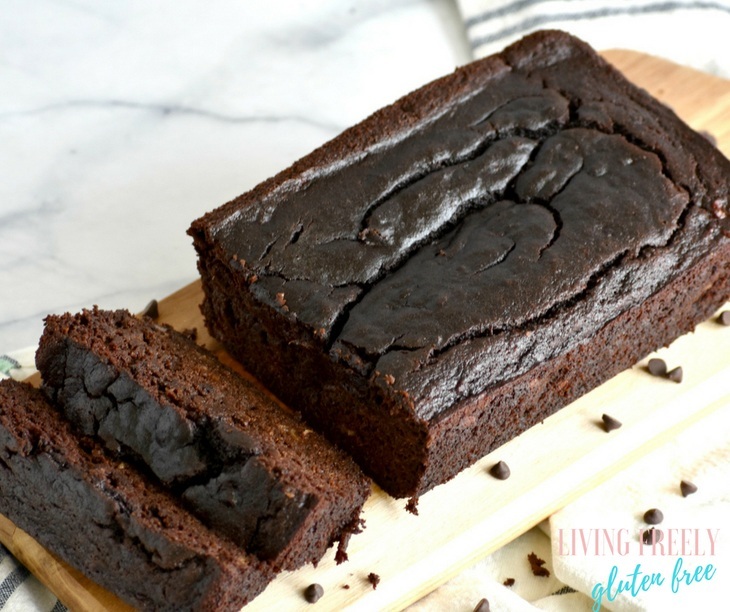 So, next time you need a gluten free chocolate banana bread recipe know with confidence that this paleo chocolate banana bread recipe will get the job done. Enjoy! 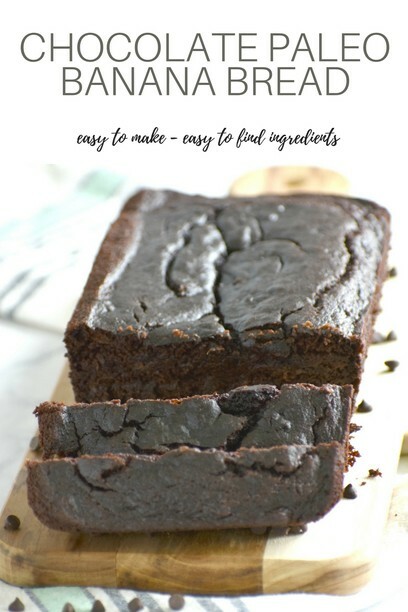 This moist and decadent Chocolate Paleo Banana Bread is easy and will be eaten quick! Grease a loaf pan. Coconut oil works amazing for this. Add the grain free all purpose flour, cacao powder, coconut sugar, baking powder, baking soda, and salt into a large mixing bowl. Whisk the dry ingredients together until they are all incorporated. Add the mashed banana, vanilla, applesauce, and eggs and stir together or mix using a mixer. Add the melted coconut oil last and blend into the batter. Pour the batter into your loaf pan and make for 55 minutes, or until a toothpick comes out of the middle of the loaf clean. Allow the loaf to sit for about 20 minutes and then you can remove it from the loaf pan by scraping the inside of the pan wall with a butter knife to gently separate the bread from the pan. Flip the pan over and pop it out. Let it cool on a baking rack lined with parchment paper. Enjoy! Need some more paleo recipe? I’ve got you covered! This looks delicious! Your instructions say to add eggs but the ingredients list does not include how many eggs. Thank you Diane, I had an issue with the recipe card. It takes 3 eggs. How many eggs does this recipe need?? 3 Eggs. So sorry Diane, I was having an issue with my recipe card. Thanks Jennifer, looking at the ingredient list I’m excited that Melissa will be able to enjoy this recipe with us, yay!